Last year, due to some forces beyond my control, we weren’t able to go to the Topsfield Fair. It’s the longest-running county fair in the country, and it’s a lot of fun. There’s so much to do and see – I have so many wonderful memories of going to the fair when I was a kid, and now the girls have memories of the fair from attending every year we lived in Ipswich. This year was wonderful – we started the day just like every year, with a trip on the ferris wheel. From the ferris wheel you can see all of the midway spread out before you, before you explore the Fair. The other reason to go on the ferris wheel is to see the foliage – all the trees spread out with their beautiful colors. It’s a gorgeous sight that I look forward to every year. The girls like looking at the Fair from the top of the Ferris wheel, but seem to prefer the fun of the ride to the view of the foliage. Looking at the fair is only the first step at the fair – there’s so much more! 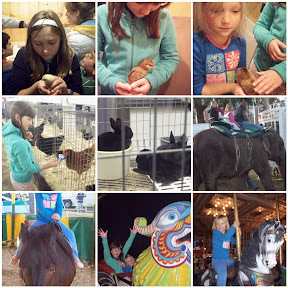 There are all the animals to look at, feed, and pet, the giant pumpkin, and all the rides to try. Plus the food! Maple cotton candy, caramel apples, fudge, maple sugar candies, chocolate covered apples, fresh squeezed lemonade, and so much more. If only we didn’t have to wait until next October for the next time!